Alison MacCarty, manager of our Lymington travel agents, took a visit to the glorious island of St. Lucia at the end of last year. Here are some of her recommendations for a trip of your own. On arrival at Gatwick, I found I had been lucky enough to be upgraded to upper class. After a swift check in, I visited the No1 Lounge for breakfast, where there was a good choice to suit all palettes. Unfortunately, due to fog, I was delayed by an hour on the tarmac before taking off. However, once we got going, the leg room was spacious and the seat fully reclined into a flat bed. There was also a bar area where you could sit and enjoy drinks and snacks. The drinks and meals served were of a very high standard and the crew were very courteous throughout the flight with nothing too much trouble. On the return, I travelled in premium economy and the leg room was good again. It’s well worth paying the upgrade from economy. The flight left a little late but made up some time en-route. The food was good and the crew were attentive. I was treated exceptionally well throughout my seven nights. There were five agents and we all had our own room/suite. The Landings was approximately one hour and 30 minutes from the airport and was situated on a breathtaking beach with the island’s only private marina. My two-bedroom villa suite was very spacious, overlooked the marina and was decorated/furnished to a very high standard. The food and atmosphere were very good with nothing too much trouble. Capella Marigot Bay Marina sits above a Marina Village. Due to this, there is no beach access, but a complimentary ferry service operates to a nearby beach. The food was excellent and the spa facilities were world class. The rooms were of a contemporary style but, due to the dark wood ceiling and mahogany furniture, were a little dark. Rendezvous is very popular amongst the British, with many repeat guests, and is a couples hotel. There were plenty of water and land sports included in the all-inclusive price. The rooms were of a high standard and nicely furnished and the Champagne Bar, complete with a pianist, was very popular for a pre-dinner drink. Sugar Beach is stunning and, as you would expect, is situated on a beautiful beach. 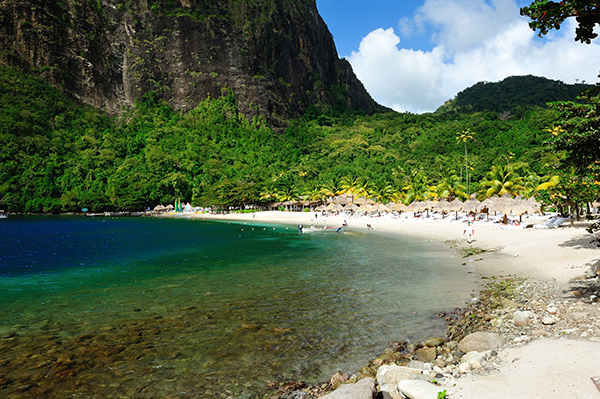 Originally it was an 18th-century sugar mill estate set between the Pitons. It covers 100 acres and a buggy service operates around the grounds, taking guests from the villas to the main hotel. All accommodation comes with butler service and the suites were spacious and extremely luxurious. The food was of an exceptional standard so were the cocktails. The trip included all food and drinks. At Capella, I had a Spa Fusion Class. This interactive activity involved mixing my own scrub, which I then used in the shower that evening. Rum tasting is a must in the Caribbean and a visit to the Rum Cave pre-dinner was an experience. Unfortunately, due to liquid sunshine (rain), our Lushan Life walking tour was cancelled. A visit to the Body Holiday with a massage was very relaxing there is also the opportunity to have a Body Science overview to find out more what is going on inside your body. An in-house doctor takes these classes along with the yoga and Pilates. At the Boucan hotel, I made my own chocolate - pounding the beans was hard work in the sunshine. It has to be the butler suite at Sugar Beach. The size of the suite together with the amenities within was second to none. The luxury this property afforded was beyond my expectations. Caribtours could not have changed anything to have made the trip better. It was a shame that the weather was disappointing for three days, though, and this did have an impact, particularly when doing hotel inspections. I would definitely recommend Caribtours as a tour operator and St Lucia as a destination. Caribtours are an upmarket tour operator and have an excellent relationship with the hotels we visited. It was obvious they work extremely close with them to make sure each holiday is extra special. 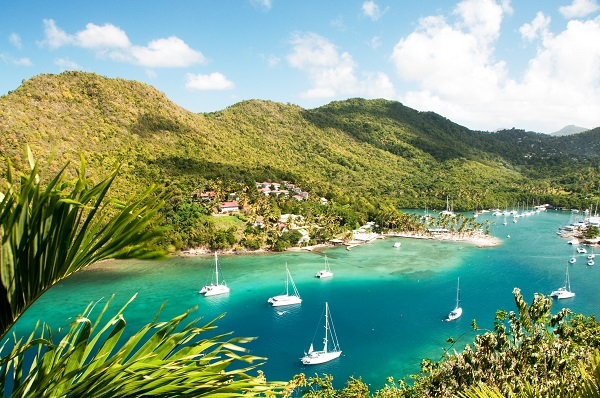 The best time to travel to St Lucia is December through to May. Travelling at the end of November, we got the tail end of a cyclone, which produced some rain and it was quite windy. St Lucia is known as the most romantic Caribbean island and is therefore ideal for weddings as well as honeymoons. The hotels on the beach and those in rural settings mean there is a location to suit all needs and wants. At Cap Maison, the hotel provides a ‘proposal concierge’. This creates an unforgettable moment, with the ring arriving by zipline at the end of your romantic dinner at the base of the cliffs. I had never thought of a twin-centre holiday in St. Lucia, but a few nights in a rural location followed by a beach stay would be ideal. The roads are full of potholes and I can understand why some people opt for a flight if they are staying in the north. If you would like to plan your own luxury holiday to St. Lucia, or any of the other Caribbean islands, our team have plenty of knowledge to share. You can visit them at any of our travel agents in Norfolk, Suffolk, Essex, Hampshire or Dorset.